Canned cucumbers are pickles. I think that sounds odd, but turns out that it does taste good. We made pickles today - 6 quarts! With these beautiful cucumbers. Cut off the blossom end of each cucumber and cut into spears. In a nonreactive pot, combine the vinegar, 1 cup water, and salt and bring just to a boil, stirring to dissolve the salt. 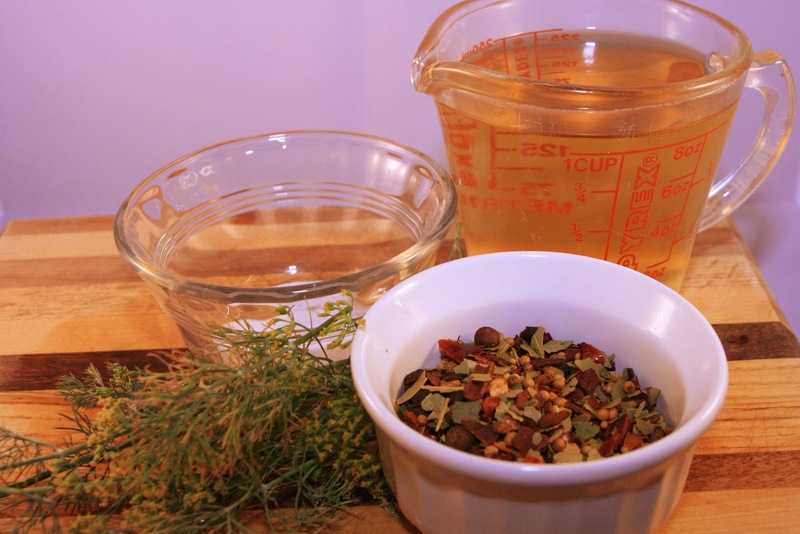 Working quickly, put a few dill sprigs into each jar and divide the garlic and spices among the jars. 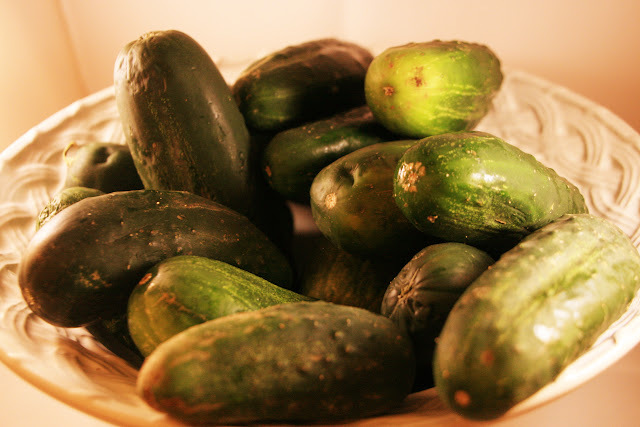 Pack the cucumbers as tightly as you can without damaging them. Ladle the hot vinegar moisture onto the jars, leaving 1/2 inch head space. 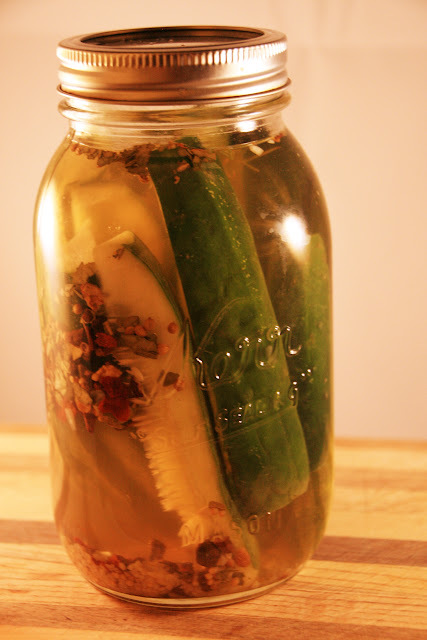 Use a chopstick to remove air bubbles around the inside of each jar. Use a damp paper towel to wipe the rims of the jars, then put a flat lid and ring on each jar, adjusting the ring so that it is finger-tight. Return the jars to the water in the canning pot, making sure the water covers the jars by at least 1 inch. Bring to a boil, and boil for 10 minutes to process. Remove the jars to a folded towel, and do not disturb for 12 hours. Dill pickles are almost the definition of canning to me. I don't think my mom ever made them, but I know Grandma did. And now I have. That feels good. Congratulations on your pickles! They look yummy! 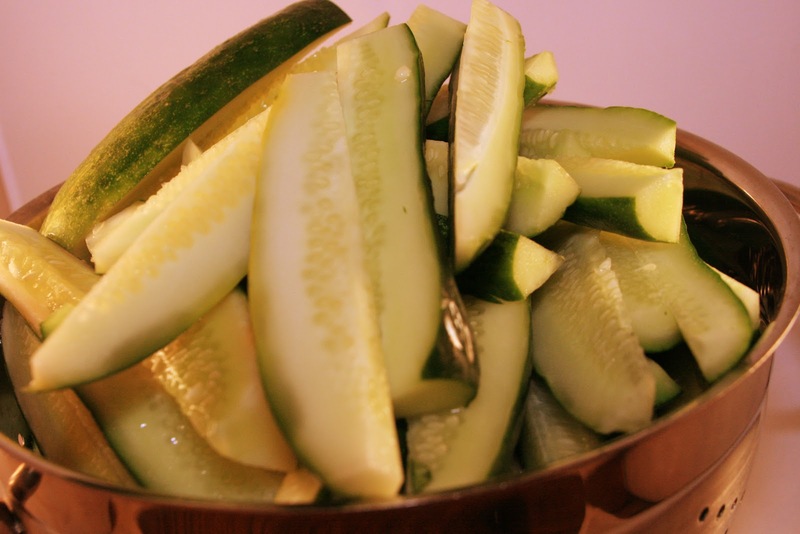 Your pickles look good! Thanks for sharing on Foodie Friends Friday! Come back on Sunday to VOTE!